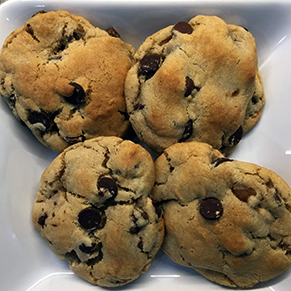 Here’s a great, soft chocolate chip cookie recipe from The New York Times Cooking blog, with my own modifications. Using a mixer fitted with paddle attachment, cream butter and sugars together until very light, about 5 minutes. Add eggs, one at a time, mixing well after each addition. Stir in vanilla. Reduce speed to low, add dry ingredients and mix until just combined. Mix chocolate chips into the dough. Shape into a ball or round log, cover completely with plastic wrap and refrigerate for ~24 hours. (Dough may be used in batches, and can be refrigerated for up to 72 hours.) Remove from the fridge 2-4 hours before you want to bake the cookies. When ready to bake, preheat oven to 350℉. Line a baking sheet with parchment paper or a nonstick baking mat. Set aside. Use your hands to make an approximately 2-inch ball, then flatten slightly onto the baking sheet. Sprinkle lightly with sea salt and bake for about 10 minutes, until golden brown but still soft. Remove from oven and let set on the baking sheet for a couple minutes. Transfer to a wire rack for ~10 minutes to cool. Yield: A couple dozen, depending on how large you make the cookies.